Soft, supple, glowing skin will always be desirable to me, it’s something I’m constantly working towards achieving (since I’m getting older by the year, which is normal…I guess. Although I would really appreciate it if someone could discover the fountain of youth soon). Clear, youthful skin…the stuff my dreams are made of! Last year was the year I really started taking care of my skin, I tested out a heck of a lot of products to find those special items that work best with my skin. I went through a bad patch (blemishes and uneven skin tone) towards the second half of 2014 and discovered some real gems along the way. I’ve already covered my favourite hair care and bath & body care products, so today we’re chatting about my top skin care picks. The products that blew the socks off me in 2014. Do you have your favourite cup of deliciousness ready? Let’s jump right in! ♥ NIVEA Daily Essentials Refreshing Facial Wash Gel (R 49,99) – in my mind, there’s absolutely no reason for one to spend a huge amount of money on a facial cleanser (it all goes down the drain in a matter of minutes anyway, right?). If you read my Clarisonic review blog post, then you’ll know I’ve been using this cleanser non-stop. It removes every speck of grime and eye makeup, plus leaves the skin feeling clean, yet ‘comfortable‘ (not tight, dehydrated or over-scrubbed). NIVEA products are available at leading retail outlets, but I like to buy my products at Clicks so that I can get that nice cash-back voucher every few months. ♥ REN Flash Rinse 1 Minute Facial (R 470,00) – a facial in 60 seconds? Yep, you heard me! I like to use this skin treatment once a week, although the packaging says one can use it every 3 days. The texture of it is slightly grainy, the colour is my favourite shade of minty green and the scent is deliciously zesty. What I find really interesting about this is that it contains encapsulated Vitamin C (that’s why it’s a tad grainy), which means when you add a bit of water (once you’ve applied it to the skin), the Vitamin C is activated and the little capsules *POP! * to create a tingling gel. I then massage it into the skin and leave it on for about a minute (I find I can’t leave it on for much longer as the Vitamin C is quite potent and it starts to sting), rinse and my skin is left feeling clear, refreshed, revitalized and rejuvenated. My skin has that glowy radiance to it, plus feels smooth to the touch as well. The REN Flash Rinse 1 Minute Facial is suitable for most skin types (unless you have super sensitive skin) and is available in the REN SA online store or in selected Woolworths and Foschini stores. Top Tip: A major benefit of using skin care products that contain Vitamin C (a great antioxidant), is they even out skin tone, brighten the skin, and help to boost collagen over time. ♥ LUSH Mask Of Magnaminty (R 115,00 for 125g / R 215,00 for 315g) – I’ve mentioned this little miracle face mask at least twice on the blog (here and here) and it seems quite a few of my blog readers are hooked on it too! I’m all about good quality, results-driven face masks and Mask Of Magnaminty does not disappoint. I use this as both an all-over face mask, or a spot treatment and it clears up any problem areas really well (a 31-year old shouldn’t have to deal with blemishes! ), whether they have been brought on by hormonal fluctuations or just plain ol’ stress. The scent is deliciously minty, the texture is the perfect mix of gritty and creamy – so it exfoliates the surface of the skin as well, a double-duty product…I love it! If using as an all-over face mask, I apply it to the skin and leave it to dry and harden (it takes about 10 to 15 minutes), I then add a little bit of water to soften up the mask, whist massaging in circular motions. Rinse, pat dry and my skin is left looking clear and feeling smooth to the touch. You can read my full review here, I give you all the info you need to know about this refreshing face mask. Regular use has cleared up my skin significantly (those pesky breakouts are a thing of the past), and I use it now every 10 or so days to maintain clear skin. Trust me, if you have issues with oily (or combo), congested and problematic skin, this little tub of goodness will change your life! It absorbs oil, decongests pores & makes you forget you even have a T-zone. LUSH Mask Of Magnaminty is available in the LUSH SA online store (although it’s out of stock at the moment since EVERYONE loves it), as well as in-store at Cavendish, V&A Waterfront, Canal Walk and Gateway. ♥ Sorbet Firming Face Mask (R 37,95) – I’ve always been a fan of the Sorbet sheet masks, they’re affordable and give your skin that extra oomph it needs (whether it’s a boost of hydration, a brightening treatment, a firming & anti-aging pampering, or perhaps something to take care of those nasty blemishes), Sorbet has got you covered! In all honesty, I find the original face masks do exactly the same thing as the new ‘Sorbet 2-in-1 Serum Masks’ – both are sheet masks infused with serum (the 2-in-1 version just has additional serum that you apply as the first step before you lay the mask on your face). Here’s a tip: Apply the serum that is left over on the sheet mask to the neck and décolletage area, as those are the areas that show the first signs of ageing. Sorbet face masks are available at Clicks stores and Sorbet salons. ♥ Dermalogica AGE Smart Antioxidant Hydramist (R 170,00 for 30ml / R 550,00 for 150ml) – I mentioned this hydrating facial mist in my ‘October 2014 Favourites’ blog post and I’m still in love! I finished my first travel sized bottle in November last year and was about to purchase another one, when I attended a Dermalogica event and was given a press kit that included a brand new one (I was SO happy to see it in the box). This facial mist soothes and hydrates, leaving my parched skin feeling petal soft. I mainly use it as an anti-aging toner but it can be used over makeup too, so you can give your face a couple of spritzes to refresh your makeup during the day or night. Available at Dermalogica Concept stores, Sorbet salons and other Dermalogica-stocking salons. ♥ Kiehl’s Super Multi-Corrective Eye-Opening Serum (R 495,00) – I’m so surprised I haven’t mentioned this in a previous monthly favourites blog post. It has become my favourite eye treatment, my holy grail firming eye product and I will definitely be purchasing this once I’ve dispensed every last drop from the container. What I love most about this eye serum, is it has been designed for the full orbital area – you can use it under the eyes, around the crow’s feet area, on the inner corner area, plus on the eyelid too! I don’t know about you, but I struggle with wrinkly lids, deepening laugh lines and dehydrated dark under eye circles (this usually means concealer either creases or looks uneven around those areas). This pearly serum contains light reflecting minerals to illuminate the eye area, as well as key ingredients to help address thinning skin and dehydration. The velvety formula melts into the skin, hydrates the entire eye area, plus smoothes & tightens up the wrinkly areas (‘wrinkly’ should be a swear word in my honest opinion). Serums are usually lighter formulations (compared to an eye cream), so they tend to absorb quickly and penetrate deeper. The Super Multi-Corrective Eye-Opening Serum is available at your nearest Kiehl’s outlet in Edgars stores. ♥ Freeman Cucumber Facial Peel-Off Mask (R 63,95) – Raved about in this blog post, I’m still using (and loving!) the heck out of it. This mask is suitable for normal, combination and oily skin and helps to clarify, renew and soothe congested skin. It basically degunks & deslicks, and then peels off in one super satisfying sheet. I’m so impressed with it, I purchased the Freeman Anti-Stress Dead Sea Minerals facial mask (turquoise blue tube) and the Freeman Creamy Apricot Facial Scrub (sachet size) just the other day. You can purchase the Freeman face masks & face scrubs in a small 15ml sachet (R 16,95) if you would like to test them out before buying a full-size tube. Freeman products are available at Dis-Chem stores. These products served me so well throughout 2014 and all of them have found a permanent spot in my current skin care routine. 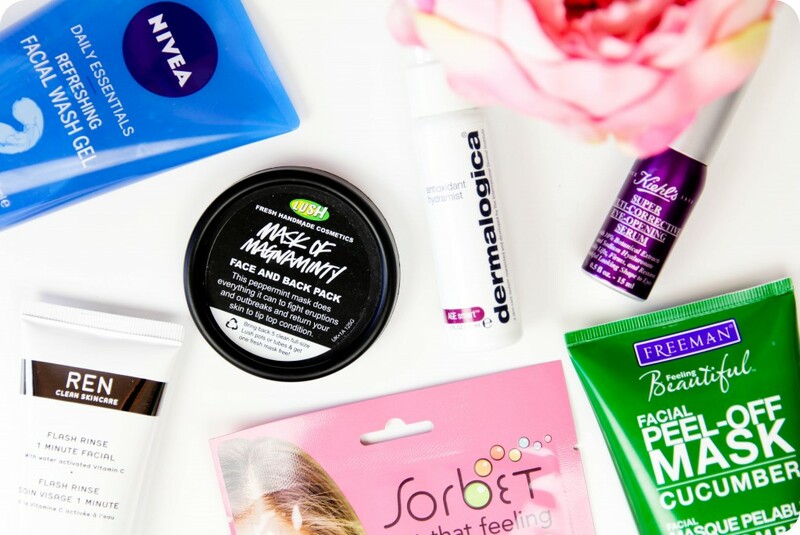 Remember, though, I have combination skin…so if you have super dry or very sensitive skin, some of these products might not work for you. I hope everyone has a lovely week – you can look forward to my ‘Best Of Beauty – Makeup Edition’, a ‘Birthday Wish List’ blog post (I can’t BELIEVE I’ll be turning 32 this year! ), plus a few other blog posts this week. P.S. Would you guys be interested in seeing a ‘Best Of Beauty – Fragrance Edition’ and ‘Best Of Beauty – Beauty Tools’ blog post? Great post Luzanne! I love the Freeman masks as well! Thank you, Janneke! 🙂 They are such great quality for the price. Will definitely do them for you, Nousheen. 🙂 Thank you for taking the time to read my blog posts. I really enjoy reading your detailed and super informative blog posts! That Kiehl’s eye serum looks like just the product I need to try. Hope you have recovered well from your op. I’m feeling much better, thank you for asking. 🙂 My energy levels are pretty much back to normal – SO relieved! Really enjoyed this blog post, thank you 🙂 I would definitely love to see ‘Best Of Beauty – Beauty Tools’ post. Hiya Luzanne….Onmiddellik oppad Lush toe (weer…. :-)) vir daardie masker! Dankie vir al die wenke en produkte! Se my net gou – hierdie post lees 26 en die vorige een 23 – het ek die ander gemis? I love the Sorbet masks! They are definitely affordable and do the job well! Definitely interested in a best of make up post! Yes! Yes! Pleeeez do more best of beauty blog posts, really enjoying them!! Im super excited about the nivea im using the pink one for dry and sensitive that you recommended and i love it. Looking forward to the all posts especially the birthday wish list (my birthday is in March) and yes please Best of Beauty – fragrance and beauty tools.